On his thirteenth birthday, foster child Alcatraz Smedry gets a bag of sand in the mail-his only inheritance from his father and mother. He soon learns that this is no ordinary bag of sand. It is quickly stolen by the cult of evil Librarians who are taking over the world by spreading misinformation and suppressing truth. Alcatraz must stop them, using the only weapon he has: an incredible talent for breaking things. I actually did not like this one as much as I had wanted to. It is Sanderson, and he does write well, but I think it was the story and the tone. It was too MG for me. But for the MG/YA crowd out there, go for it. Alcatraz...how to even explain this without spoiling it all?! 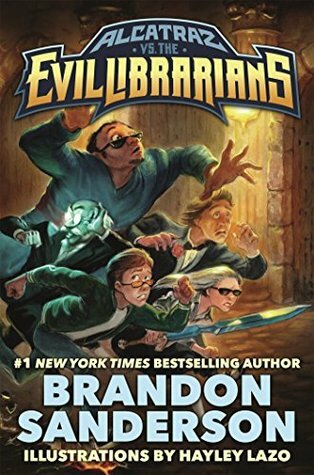 Librarians are bad, I mean really bad, and they rule the world.There are other places where they do not rule and those people try to fight them off. And Alcatraz finds out that he is from one of those places. Off he sets on an adventure with his crazy grandpa and friends. He has no idea what is going on. They all sound insane. There are evil librarians after them. Secrets, and more. So it was good, but I was not the audience for this and could not always like it. But I can appreciate the craziness.